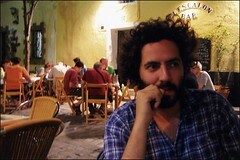 Dan Bejar is taken by most to be Destroyer, although Bejar insists that Destroyer is a band project and always has been. Within the shifting ensemble that has made up the band on the seven albums released, including 2006's Destroyer's Rubies, Bejar is certainly the central figure. His mind and hand draw out the words, the poetic images, the melodies which entrance. Songs such as "European Oils", "Painter In Your Pocket", and the epic "Rubies", breathe fragrant melodies, melodies that bear the stamp of art and the shapes of poetry. Listening to Destroyer is like listening to the charismatic leader of a strategic European country... one delivering a speech in his own tongue. You don't understand it, but you know it's important. And that's okay, you're just visiting... a vacation into a land of poetry, melody, and wine. *Sixeyes comunicated with Destroyer's Dan Bejar via email. *Sixeyes: You described, quite succinctly, your last album, Your Blues, as being European Blues... what would you call or what genre would you create for the music of Destroyer's Rubies? *SE: You have written the bio for fellow Merge Records artists, Tenement Halls, the band fronted by former Rock*A*Teens, Chris Lopez, and in it you finish up by asking the reader to, "... just listen to the whole record repeatedly, and it will make sense. Not that it needs to." From that, I am wondering if you want your own records to make sense to the listener? A repeated refrain in articles, or interview preambles is, "He makes records that no one understands".. do you want people who listen to understand? What would you like the listener to or get out of a Dan Bejar record or song, out of the new record, Destroyer's Rubies? *SE: Are the lyrics important to you? The meaning of the words, I mean... or is it the sound of them, their pronunciation, which is of more interest? *SE: Have you developed a method, or process, for writing? I mean as far as environment or time of day is concerned? Are there any little tricks that you use to kick start yourself when the muse goes missing? *SE: When you started to write songs, was it a matter of fitting the words to the music, or the other way around? *SE: Along the same lines... Is your idiosyncratic vocal delivery a style you wished to develop, or is it the end result of your word heavy, image thick, and intricate lyrics? *SE: "It's Gonna Take An Airplane" from Your Blues, a favourite of mine, has a very slack, laid-back 60's 'Euro Pop' feel. The song's opening conjures for me arty French movies starring Jean-Paul Belmondo. Do you ever write songs trying to capture a 'feel' that you've felt from other music or film? *SE: Were all the songs for Destroyer's Rubies written at the same time? *SE: What about inspiration? Do you find it easily, or is it something you chase like a missed bus? Did any specific work of art inspire you as you were writing the new album? *SE: After you've written a song, can you ever relax and feel proud of what you've done, or are you constantly worrying away at bits and pieces of it...Are you ever completely happy with what you've done, or is a nagging doubt what drives you to continue writing? *SE: Did you sweat over the details of Destroyer's Rubies release, such as the cover art, the track sequencing, the title of the album? *SE: Can you remember what albums got you excited about music when you were a kid? What music opened that door to show you a new musical world? *SE: And finally, what does the coming year hold for you? Touring, recording, writing? 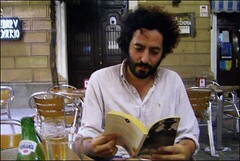 Destroyer's Rubies will be released February 21st on Merge Records. Check out this post for free and legal Destroyer mp3s. Oh thank you, thank you for this wonderful interview. I looooooooooove Destroyer. I could say: obsessed. way to go with that, sir. i'm envious!